Steady to Wing is pleased to announce breeding plans for Spring/Summer 2019. Our proven Dams, "Steady to Wing Xena" (Xena) and "Steady to Wing Lady Ziggydocious" (Ziggy) will be bred with our Stud, "Steady to Wing John Boehner" (Bo). Click each Dog's call name to view their page. Pups are anticipated to be ready to go home around the middle of July to End of August, we'll update the page as we get closer and know more certain dates, so check back often! Xena is a stylish 48 lb female with classic GSP Liver and White coloring. She's a phenomenal bird dog with a fantastic nose, big run and drive, excellent bird sense, and a natural retriever. She's also a joy at home, the kids love her and she loves the kids, she's a goofy pup and a lot of fun to have around. Xena comes from an impressive set of champion lines as well as spends a significant amount of time hunting wild birds. She's the whole package, everything you could ask for in a GSP. Xena has a proven track record of passing these stellar attributes to her pups. Ziggy is a stylish 50 lb female with heavy liver patch and tick. She's an excellent bird dog with a fantastic nose, big drive, uncanny bird sense, and a natural retriever. She's a medium ranging dog that will go all day long. She's also a loving mother and takes wonderful care of her pups. Ziggy comes from an impressive set of champion lines as well as spends a significant amount of time hunting wild birds. Bo is our established kennel stud, he has been exemplary in the field and lives to hunt. He's our "lap dog" when he's not hunting and loves to be with his people. 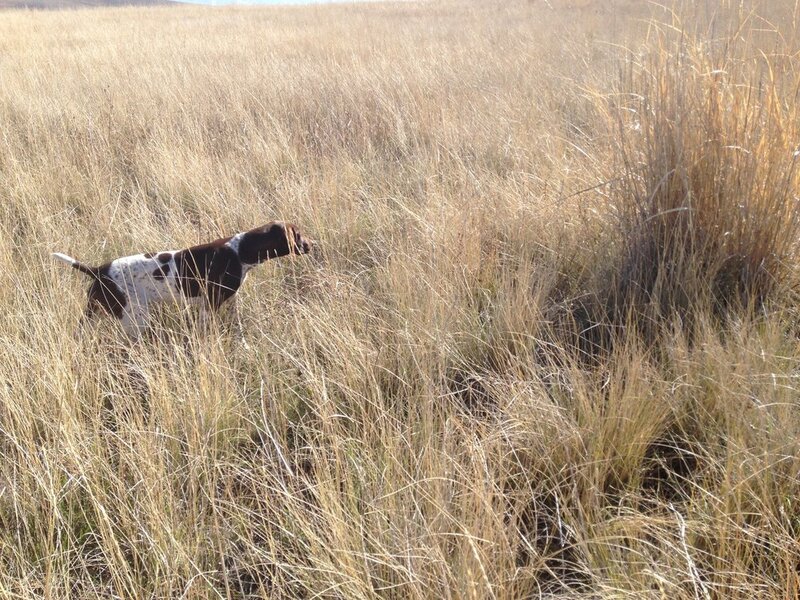 Bo has shown a history of throwing intelligent, biddable pups that make fantastic bird dogs as well as companions. Bo is a large male at about 65-70 lbs and is on the tall side. He is a striking, solid built Black Roan dog that is very impressive to watch work. He excels at adjusting his range based on cover. His lines include many JH, SH, and MH dogs, DKV (German) dogs, as well as trial champions. Reservations are $300.00, Contact us for more info or to Reserve your pup. Bo on a unique situation of a ice retrieve.